Which writer’s conference should you go to this year? American Christian Fiction Writers? Or Realm Makers, the hub for Christian speculative writers? Today, I’d like to compare these two conferences, so we can find out which is the conference for you. Note: I’ve been to a grand total of two conferences: one ACFW conference and one Realm Makers conference, so I haven’t been able to include as many comparisons as I’d like, since I’m uncertain how similar the conferences are from year to year. As the conferences change, some of the following may be inaccurate. My critique partner and I were trying to find each other at ACFW, but couldn’t for the first few days. We kept on texting back and forth until we found a snippet of time and a clear hallway to meet in. At Realm Makers, I easily found all of my critique partners. It’s a sizable conference, but small enough that you can find the people you need to. 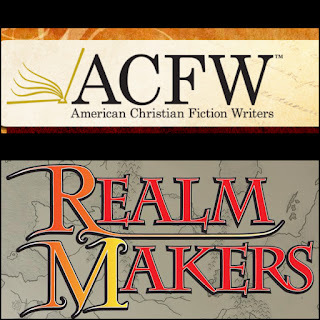 While Realm Makers makes it easier to find people, ACFW’s size means that there are more opportunities to meet an agent, author, or writing coach you’ll click with. The appointments themselves offer more opportunities. 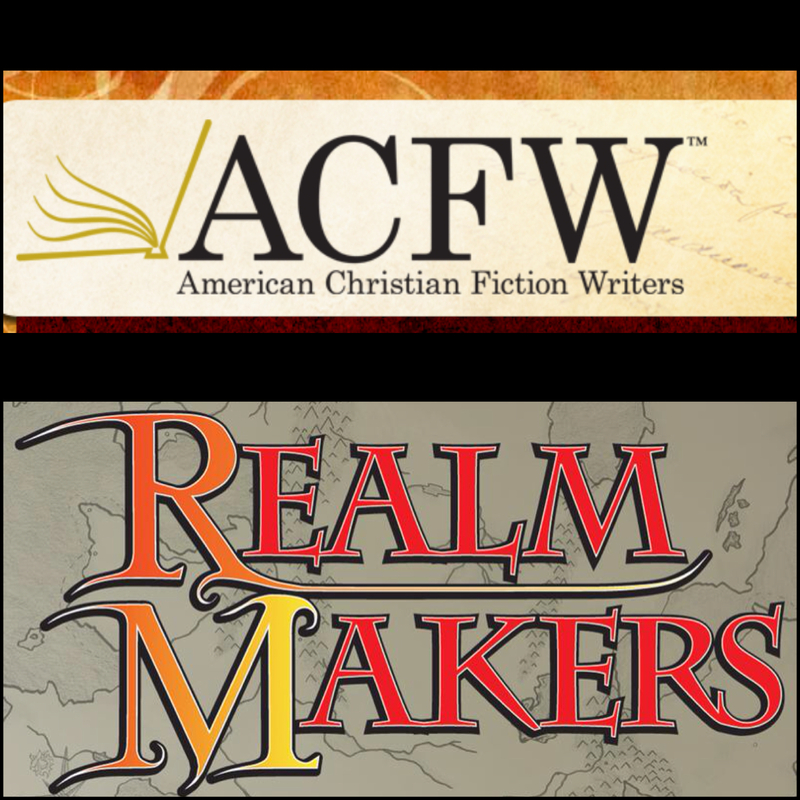 This year, ACFW has 13 agents available for appointments, while Realm Makers had two, but to be fair only four agents in ACFW are open to speculative. For ACFW, think business casual to business professional. For Realm Makers, think casual to business casual. As a rule of thumb, try to dress at the upper end of the spectrum. At ACFW, I brought two sets of business suits with matching skirts and blazers along with two professional dresses. For Realm Makers, I packed pretty blouses and nice jeans. Even some business casual outfits would be pushing it. I don’t remember how frequently, but at ACFW, there was a part of the conference where everyone gathered in the main room and a worship band played. ACFW also has a marketplace available, which essentially means an area with folding tables where people who have something to offer authors can set-up a stand. 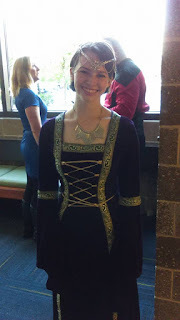 Realm Makers did have a bookstore (where they sold gorgeous Elven crowns, which you can see me wearing below with a couple from Star Trek behind me), but it didn’t offer the things that the ACFW market place did, like writing coaches and website design. The first evening at Realm Makers was the Splickety Kick-Off Party. In one of the games they offered, you had to hold two wooden skewers inside either side of your mouth and move them like chopsticks with your lips to take three marshmallows to a table a few feet away. Then you had to stack the marshmallows on top of each other, so they stayed upright for three seconds. I participated and—unfortunately—lost, due to the fact that one of the competitors was “using his head.” ;) In other words, he mashed the marshmallows together with his forehead. And the Nerf War. That was definitely one of the highlights. If you go to Realm Makers, take a Nerf gun and Nerf darts—just in case. They’ve had a Nerf War for the past two years, but I’m not completely sure they’ll have one next year. On the last night, I stayed up until 1:30 playing capture the flag. It’s a ridiculous amount of fun. Until you die. Then you have to hang out in the morgue, talking with other dead people and eating brownies. An activity that both conferences offer is a costume dinner. At ACFW, you dress according to your genre. 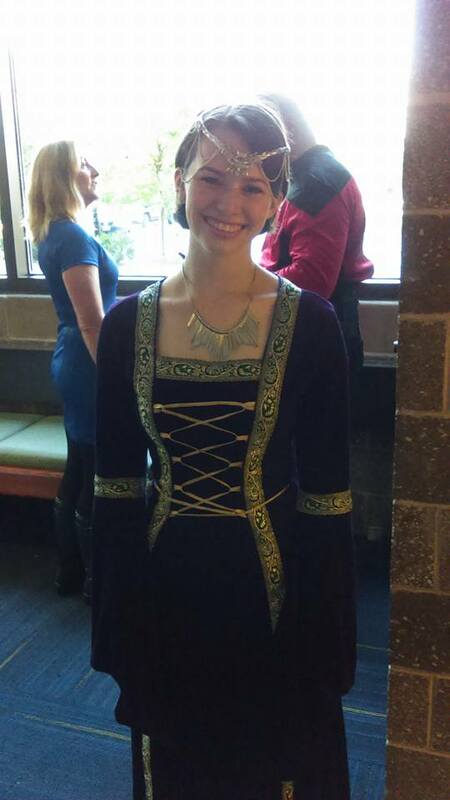 For Realm Makers, you dress up as your favorite speculative character or a character that interests you. At ACFW, you specifically sign up for all of your classes. At Realm Makers, you sign up for the Continuing Session and just show up at the electives. Both offer panels and various appointments with agents and editors. Many appointments offered at Realm Makers were with small publishers. Both have early bird sessions, while ACFW has a post conference session in addition. Both offer opportunities to volunteer and have people available to pray for you. Both have recordings of the conferences. I haven’t listened to the recordings from Realm Makers yet, but judging from the device used to record (a black, plastic recorder), the recording probably won’t be as high quality as the ACFW recording, since they had some sort of recording program connected to the microphones. After Thomas Locke’s Continuing Session, he asked me which conference I liked better. I couldn’t say then, and I can’t say now. Both have an amazing community and offer amazing opportunities. It simply depends on what you’re trying to get out of the conference. If you want to have as many agent appointments as possible, go to ACFW. Want a more casual environment? Go to Realm Makers. If you write speculative, you’ll obviously find more like-minded people at Realm Makers and more agents/publishers looking for your genre, but the diverse group of authors you’ll meet at ACFW is worth meeting too. Which writer’s conference would you like to attend? Have you been to an ACFW or Realm Makers writer’s conference? Great post, Liz! It was really interesting to hear your perspective of both conferences, since I've only been to Realm Makers. I'm guessing I'll end up at Realm Makers more frequently in the future, but I'm definitely hoping to make it to ACFW one of these years, too! This was so helpful. I think Realm Makers sounds like it would be more my speed- more casual and intimate, plus having fewer crowds of people would be good for this introvert. :) But I can definitely see the advantages of being able to meet lots of agents at ACFW. Thanks, Liz! My pleasure, Brenna :) Glad you liked it! This is a great thorough and clear comparison, Liz! It's so helpful to know these things before making a decision and spending the money for the experience.